Fears that all trains from Ashford to Europe will be axed after services were cut last month, have come from an MEP. Sharon Bowles has begun a campaign to save Eurostar services to and from the town's £80m international station. Ashford International will lose all Brussels trains and off-peak Paris services when the £100m Ebbsfleet station opens in north Kent next year. 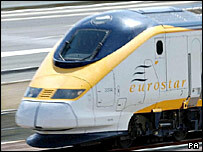 Eurostar said demand for Brussels trains was low, but it hoped business at Ashford would build up. Richard Brown, Eurostar's chief executive, said its one train to Disneyland carried more passengers each day than the current three services to Brussels. He said nine out of 10 passengers wanted to travel between city centres and added: "You don't build high-speed lines in order to stop trains regularly." But he said Eurostar would work with Kent agencies to start building demand from Ashford, which has been earmarked as a growth area. "We do see Ashford as absolutely complementary to Ebbsfleet," he said. Liberal Democrat MEP Sharon Bowles said she had not been able to get "a categorical assurance" that services from Ashford would remain. She said she wanted to see some trains calling at both Ebbsfleet and Ashford when the new station opens. She called on Eurostar to pledge that it would not force a closure of Ashford International Station, that a frequent international service would continue, and that Ebbsfleet would complement Ashford and not replace it. This week, Ashford Tory MP Damian Green warned Labour of complacency over the cutting of Eurostar services from Ashford. The government has denied the move will damage the town and has said more than 80% of current demand for services from Ashford would continue to be met.